The Office for Institutional Equity and Diversity (OIED) helps to foster an inclusive, accessible and diverse university through a broad array of programs, services and events, but we do not do our work alone. We depend on friends and allies, locally, nationally and globally. The Diversity and Equity Fund enables the Office for Institutional Equity and Diversity to fund important campus initiatives that further our progress toward making NC State an even more inclusive and equitable place for all. The African American Cultural Center provides a scholarly and cultural home for those who appreciate the African and African Diaspora. Your donation will fund programs and projects that enhance NC State’s commitment to preserving and advancing our rich history and heritage. The GLBT Center provides a safe space for all those who identify as part of the GLBTQ community and all of its intersections and allies. Your donation funds programs and services that help make NC State a welcoming, affirming and empowering place for all. Multicultural Student Affairs provides student support and success initiatives that empower students to arrive and thrive. Your donation funds programs such as the Symposium for Multicultural Scholars, the Peer Mentor Program, and many others that make a profound difference in the ability of students to succeed at NC State. 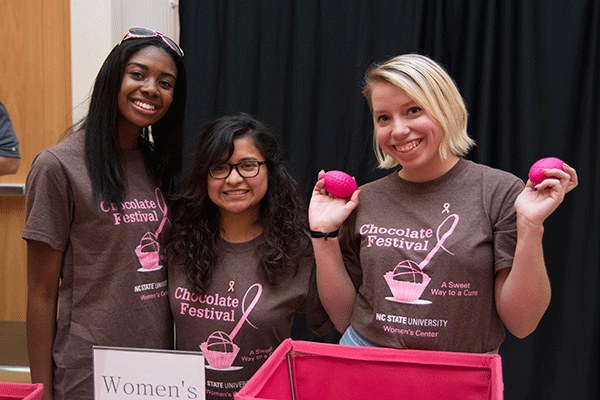 The Women’s Center has made a difference in the lives of countless NC State women. In addition to programs that empower, the center also provides support and advocacy for those who have experienced interpersonal violence. The center’s mission is to educate, advocate and lead. OIED welcomes your gift of time. Whether you would like to volunteer as a literacy mentor for local youth or assist peer educators in the Women’s Center; participate in lectures, readings, community dinners or the art gallery in the African American Cultural Center; help to strengthen GLBT Center programs on campus; mentor students in Multicultural Student Affairs; mentor faculty members as part of the Multicultural Faculty Group, the Council on the Status of Women or any of OIED’s other constituent focus groups; or simply serve as an event or program volunteer within any of our units, we welcome your time. Please contact the center or unit you are interested in volunteering with for their specific needs.